So in studying I've run into a problem where I don't understand the explanation for the answer. The NMR shows there are five types of hydrogens, listed below. What I don't get is why Hb has five signals, when the it has 8 neighboring hydrogens. I don't have the name of the molecule, but I will describe as best as I can so you can draw it out. I have an isopropyl group bonded to an oxygen, which is bonded to a carbon that is double bonded to an oxygen and an ethyl group. This will have the formula of C7H14O2. The Ha corresponds to the two methyl hydrogens on the isopropal, then the rest fall in order from left to right. Any help would be much appreciated, thanks! There is no such group or compound called propal. Are you sure that you see 5 signals? may be the 6th is overlapped? My picture was super blurry, I know now there are in fact 7 signals. However wouldn't we still expect to see 8+1 signals? And yes my mistake, isopropyl. As in there are two methyls attached to a carbon, which in turn is attached to another carbon, which is attached to the oxygen. What is the degree of unsaturation? What are the ppm shifts of the signals? It will be easier for us to help if you upload the spectrum and give either the drawn structure or the systematic name. You can upload by clicking "additional options" which is located at the bottom left hand corner of the reply window. 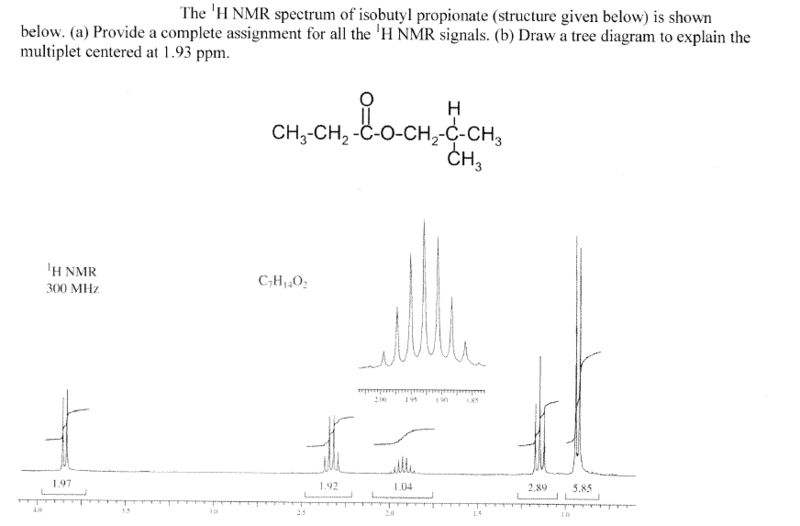 Description of NMR spectra contain also other data which are very important. Here you can also see the 9 peaks, the two outermost are almost in the noise, though. Yes, it is isobutyl propionate. Thank you for all the links showing me how to draw them, I will use that in the future. So you're saying there are 9 peaks there? Because that would make sense, but that blows my mind, they're so tiny! But if that is the number of peaks then I suppose that answers my question, must just be a bad graph they gave us. Thanks you! So you're saying there are 9 peaks there? Because that would make sense, but that blows my mind, they're so tiny! Because of these things I think it's extremely important to learn to read spectra by using REAL spectra. Way too often professors teach with simulated spectra, without noise, without artefacts.